I made it out to Café Boulud recently on a wintery Friday night. It was the perfect setting in which to keep warm against the outside chill. Luxe leather chairs and banquettes paired with contemporary French bistro style lighting, created very much a French bistro feel. Every detail has been thought through down to the bistro style red striping on the cloth napkins. The only down side at all, is on a busy night, the noise from D bar one level down, Cafe Boulud is on a mezzanine level overhanging the bar which means if you are seated near the edge of the restaurant you can hear rowdy groups below. Thankfully the café is enchanting enough that it’s able to keep you distracted for the most part. We started the meal with the Canadian oysters, a selection of 6 market oysters at $18cdn, fresh and served with a light mignonette. likely would not order this starter again. As my main I ordered the Confit de Canard. Slow cooked duck, perigord style sautéed potatoes, and parsley salad for $36cdn. I have absolutely nothing but glowing praise for this dish. The duck was absolutely perfect and pretty much melted in my mouth. I would order this again in a heartbeat! 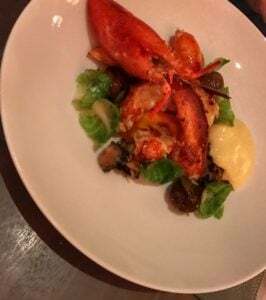 My companion ordered the Homard aux Choux, grilled lobster with bok choy cabbage and ginger beurre blanc for $56cdn. The lobster was perfectly done and there certainly was not a single bite left on the plate. The presentation and plating was also stunning. Unfortunately there was no room in my tummy for dessert, next time I’ll probably forgo an appetizer to ensure I can finish off with a sweet. Looking around, a popular selection seemed to be the Baked Alaska for two, pistachio and vanilla ice cream, raspberry sorbet, and fresh meringue flambeed with kirsch. It was a show watching the flambéing done table side. For full menu, to make reservations, and any other additional information visit the Café Boulud website HERE. This past fall I had the awesome opportunity to take a short trip down to New Orleans (affectionately known as NOLA). I’m not going to go through my whole trip because, let’s be real, all you really wanna know is some foodie spots to hit up right? With September 30th comes the do not miss event of Fall, SwirlTO. Described as “an elevated beverage experience”, this is sure to top the beverage and culinary events for 2016. Being held at the Carlu in the heart of Toronto, this venue alone will lay the perfect backdrop for an elegant and refined experience. When it comes to culinary and beverage events, I probably share the same frustration as other participants, and that is I always end up spending a bundle by the end of the night. First you need to buy your entrance ticket, often offered at different price levels depending on access priority access or not. Then you need to buy tokens or tickets to even be able to sample anything…. by the end of the night you’re bound to be topping a minimum spend of $200 without even realizing it. Going to the Ex each year has been a tradition since I moved to Toronto 24 years ago. In recent years I have fully embraced the assortment of crazy food that has emerged each season. This year while I go on my culinary tour of wackiness I will be live updating this post with pictures and thoughts of every item I dare to try. Stand by and let your tummy fill through me… And don’t forget, you still have the whole weekend to get to the Ex yourself. Updates will start approximately 5pm est. 5:16pm do I dare try the pulled pork cinnamon bun from Howies cinnamon rolls on the midway? 10:56pm.. home and another food fest at the CNE is done for this Toronto foodie… now I need to go work off all these calories. For more information on the CNE visit HERE. This is the second year that Toronto is fortunate to have a festival dedicated specifically to sweet food. As founder of the Sweetery Food Festival, Nic Yu has her goal in mind. “We aim to be dubbed the largest sweets summer festival ever hosted in the country attracting an estimated 30.000 sugar craving individuals to this two-day event”. The festival is a completely free and an all ages event. It is also a not-for-profit organization that strives to not only allow attendees to participate in a variety of activities but also generates funds to benefit Second Harvest charity. Funds will be raised through an increased amount of games that on top of helping Second Harvest also allow participants to score a “sweet prize”. For a donation (large would be nice… wink ..wink), participants can test their knowledge in six different challenges ranging from candy trivial to a gumball shake! sure to be a fun time! If trivia isn’t your thing, have no fear. The festival focus is on providing attendees with an abundance of culinary delights to amaze you. Some of the indulgences expected this year are funnel cake ice-cream sandwiches, candied bacon marshmallow, pressed juice pops, and iced coffee parfaits. Your experience at the Sweetery Food Festival can also be educational, imagine that! George Brown college students will be on site to provide tutorials and live demonstrations on some of their skills and artistries that go into crafting their confectionary masterpieces. Don’t miss out, make sure you visit the Sweetery Food Festival at David Pecaut Square (King St and John St) Saturday August 20 and Sunday August 21. Saturday 11am – 11pm, Sunday 11am – 9pm. Check Sensi Di Colpa’s instagram page the morning of Saturday August 20th for some sneak peeks of our faves of the festival. For additional information, visit the festival’s website HERE. NOTE: Picture property of sweeterytoronto.com. Factual information contained within this post provided by the Sweetery Food Festival. I just experienced one of the best culinary experiences of my life at DaiLo. I went knowing it had gotten some acclaim and good reviews but, WOW, it was beyond any experience I could have imagined. I’d been humming and hawing about trying Fring’s for a while. Hesitation being that it would be pretentious and overpriced just based on the owners and also due to some unfavorable reviews I’d read. Fring’s was conceived through the new partnership of Chef Susur Lee and Toronto music star Drake. The culinary experience was better then I expected to be. The decor of the restaurant was entrancing and immediately won me over, a version of elevated shabby chic with rich colours and varying textures throughout. On a recent visit to Québec city I felt the last night was the perfect time to visit one of the cities classic Quebecois establishments. The restaurant has been housed in the historic Maison Jacquet since 1966. The Maison one of the oldest houses in Québec, built in 1675-76. More on the history HERE.